Elizabeth Warren, Hillary Clinton, and 2016 speculation: Media is applying dumb theories to the next presidential race. Political journalists are dreaming of a contest that’s just not there. 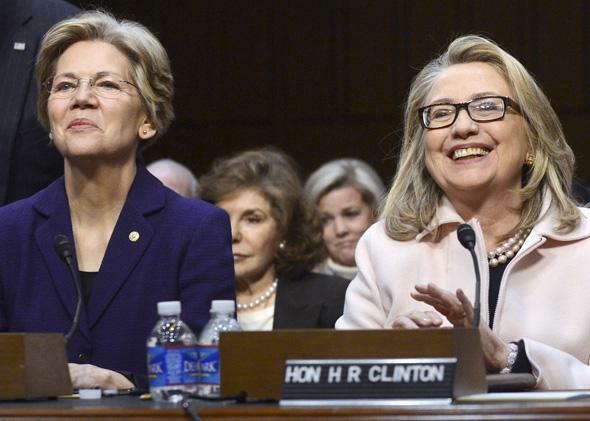 Sen. Elizabeth Warren and former Secretary of State Hillary Clinton on Jan. 24, 2013. These are dark times for America’s most beloved industry, the political media. In three years, the country will elect a new president. As they have since 2009, reporters and readers assume that the Democratic candidate, and likeliest winner, will be Hillary Clinton. Forget about the voters—won’t anyone think of the Web traffic? Nobody wants to cover the coronation of an icon who’ll be too staffed up and confident to give real access (or leaks) to reporters. Simply by existing, articles like these make a progressive upset of Hillary Clinton more likely. They alter the odds from zero to zero. Several things can be true—Warren can be outsmarting the financial industry, the Clintons can be worried about a shift in the Democratic Party, Warren might be more likely to run if Clinton does than if Clinton doesn’t—without there being any chance of the front-runner losing. Actually, the idea that an insurgency needs to seize a presidency in order to win is sort of retrograde, and it’s surprising that the disappointing (for progressives and a whole lot of other people) victory of Barack Obama hasn’t cured it. Race matters. There’s no mention of the Democratic Party’s ethnic demographics in the New Republic’s or the New York Times’ Warren pieces. Scheiber reminds us that Obama was able to upset Hillary Clinton: “All it takes is a single issue and a fresh face to bring the bad memories flooding back” among progressives. Both Scheiber and the New York Times’ Jonathan Martin mention Bill de Blasio’s victory in New York City’s Democratic primary for mayor. And you can’t explain the Obama or the de Blasio win without black voters. A refresher: The president beat Clinton in a 50-state primary that she nearly won, by the end, as the salience of the Iraq War faded. Obama trounced Clinton in most of the caucuses, building a delegate margin, but he only stayed competitive because of black voters in Southern primary states. Obama was fading until the South Carolina primary, when an electorate that was mostly black gave him a landslide that polling hadn’t predicted. There were 35 primaries to go: Clinton won 21 of them. (That number includes the Florida and Michigan races, which held votes but saw no campaigning due to a party dispute. Still, Clinton won them.) Of the states that went for Obama, only six of them—Illinois, Montana, Oregon, Utah, Vermont, and Wisconsin—gave him the win among white voters. Scheiber blinks at this. A Democrat tells him that “the typical Democratic insurgent … captivates the latte-liberal demographic but has trouble making additional gains.” Right: Obama’s “additional gains” come from nonwhites! Scheiber offers that “New Hampshire, the first primary state, is fertile ground for a Warren-esque message—not many rich people, not many poor—and 80 percent of its residents live in the Boston media market.” True. Also true: The first polling of a possible New Hampshire primary puts Clinton 53 points ahead of Warren. Clinton is more popular than ever. The typical, facile lead-in to any discussion of possible Clintonian weakness goes like this: Well, in 2008, she was supposed to be “inevitable” and look what happened! True: In 2007-08, at the height of the Iraq surge, the Democrat who had voted for the war and not apologized was eventually defeated. Clinton is no longer that candidate, and polls stronger among Democrats than she ever has. Stick to the New Hampshire example. In every poll of the 2016 primary, at least 55 percent of primary voters have backed Clinton. Not once did Clinton ever crack 50 percent in any poll of the 2008 primary. In the only poll that was in the field in October 2005 and October 2013, the University of New Hampshire “Granite State poll,” Clinton’s new strength is impossible to miss. Eight years ago, the poll found Clinton at 33 percent, 12 points ahead of her closest rival, John Kerry. Last month it put Clinton at 64 percent, 58 points ahead of Warren and just as far ahead of Vice President Joe Biden. Eighty-four percent of Democrats viewed her favorably. Already, almost twice as many Democrats viewed Warren unfavorably (15 percent) as viewed Clinton that way (8 percent). Are those static numbers? Well, no. They’re just worlds better than anything Clinton scored in 2008, in a state she won anyway. The PCCC also endorses progressives against Democratic establishment candidates—and here, it doesn’t do so well. In the 2012 House race cycle, the PCCC endorsed against California’s Scott Peters, Connecticut’s Elizabeth Esty, and Illinois’ Brad Schneider. All of those Democrats won their primaries. This year the PCCC tried and failed to draft Montana’s former Gov. Brian Schweitzer into a Senate race, then endorsed a candidate for an open seat in Warren’s own Massachusetts. The PCCC’s candidate came in third place. The winner, Katherine Clark, was endorsed by the pro-female PAC Emily’s List. * And Emily’s List is now holding events in primary states, letting reporters know that it will repeat its 2008 endorsement if Hillary Clinton runs. The point isn’t just that Hillary Clinton is the Democratic front-runner. No one doubts that; everyone’s a little bored by that. The point is that it’s risky, weak strategy to make a presidential primary the test kitchen for policy change. Conservatives learned this brutally in 1972 when they urged Ohio Rep. John Ashbrook to run against Richard Nixon. “What I fear is a dissipation of our strength,” wrote William F. Buckley to a friend. He was perceptive: Ashbrook won a wan 9.7 percent of the New Hampshire vote, and Nixon was emboldened to ignore the right. Over time, conservatives stopped expecting a president to get elected, lead, and solve all their problems. They built a grassroots machine and a litany of policy goals—the activists would speak, and the president would nod along. By 2012, Grover Norquist could tell a national conference that the next Republican president need only come to the job “with enough working digits to handle a pen.” That’s where progressives need to get, that un-glamorous and under-covered triumph of movement over party. Maybe, like Ron Paul, they can use a campaign to build the ranks. But if the Obama experience hasn’t taught them that a dreamy presidential candidate won’t bring about paradise, what will?